Sometimes the best trips are the ones that happen when you and your friends or family all pile into one vehicle and drive! Even if you don’t have your destination all planned out, there’s plenty for you to see and do no matter where you go. If you’re keen on taking a road trip in the near future but aren’t sure just how to prepare, we’ve put together few helpful tips you can follow. You’ll learn how to save money, be safe, and most importantly, make the most out of your days on the road. Most gas station chains offer some kind of reward incentive fuel card program. Make sure you’ve got a card for your chain of choice before you leave on your trip and use it whenever possible. Given how much fuel you’ll need for a road trip, you’ll be raking in the free fuel/cash back on hotels/grocery discounts (or whatever else the rewards might be). You’re not always going to have the time to stop for food every time you or your passengers get hungry. What’s more, stopping for snacks quickly gets expensive. A convenient money saving solution is to pack a cooler and fill it full of food and drinks to enjoy as you drive. Always be safe rather than sorry! Make sure to let someone know where you are each day. Text your parents, partner, or friends back home every day and every night so they have a decent idea of your location in the event that something unexpected happens. If going on a trip for an extended period of time, a satellite or GPS handheld is also useful in case of emergency. 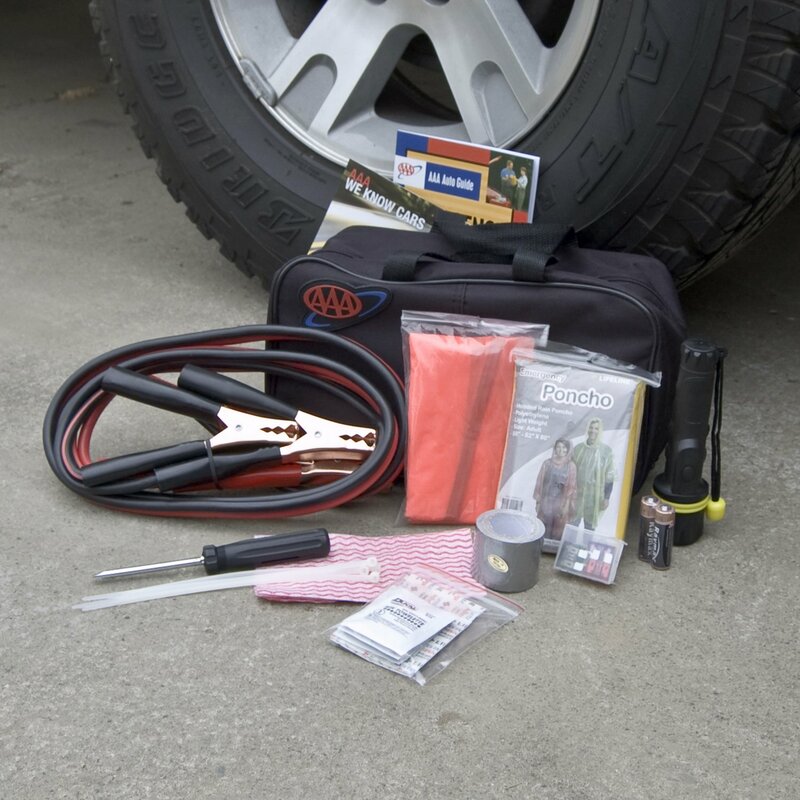 There are two spares you absolutely need to make sure you have with you on any road trip: a spare tire and a spare key. Nothing ruins a good time like getting a flat and not having a spare to swap in. Locking the keys in the car (and having to wait and pay for a locksmith) is also something you want to avoid. Before you head out on your trip, check to see that you have a spare tire (and that it’s in good condition). Cut some extra keys for the vehicle and hand them out to the members of your group. This way, in the event that you do lock yourself out of your car it won’t be a crisis. If you’re doing a lot of driving every day and staying at motels or camping every night, you’re not going to have much time to do laundry. Packing a stain remover pen can help keep your clothes clean for longer. They’re small, don’t take up much room, and are easy to use. Even in a car full of people it’s easy to find yourself dozing off at the wheel. For safety’s sake, rotate drivers. Everyone can take a turn, allowing others to catch a nap or two so that they’re ready for their next shift. For the same reason, try to get a good rest every night so you can start the day off alert and ready to go. Take breaks as often as needed. Use them for stocking up on food or drinks, stretching cramped legs, or just allowing everyone a minute or two of privacy. A few ten minute breaks scattered throughout the day can make a big difference in everyone’s mood. If you’re planning on doing some hiking at some point during your road trip, bring an insulated lunch kit. You can take some refreshing snacks and/or drinks along on your hike and be able to enjoy them cold once you reach your destination. You can buy premade kits or make your own. If you decide to buy one, you can add in any essential emergency items it doesn’t have that you think you might need in case of emergency. If you see a sign for something interesting on the side of the road, go and check it out! You never know what you’ll find and that’s half the adventure. Be spontaneous. Don’t be afraid to venture off the beaten path. Road trips are a great way to explore the country with the people closest to you. Once you’re out on the open road, it feels like anything can happen. It’s still a good idea to have a few safety precautions in place, and to make sure you’ve packed all the necessities. Once you have, you and your passengers can put your mind at ease and concentrate on having a great trip! Do you have any adventures to share with us or any other tips? Please leave us a comment below.